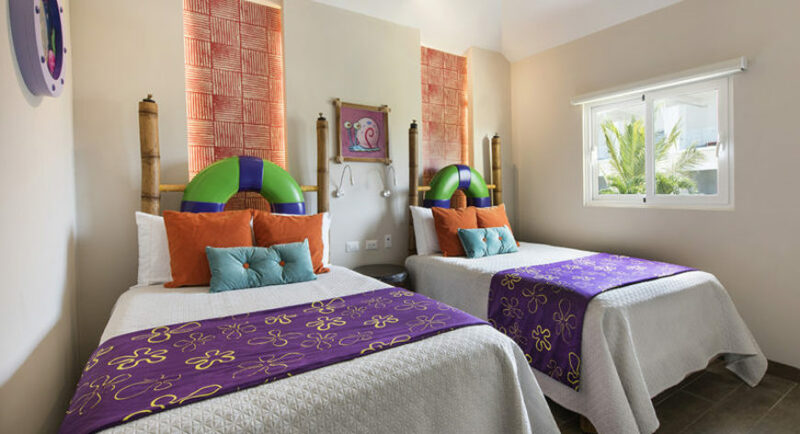 Nickelodeon™ Hotels & Resorts Punta Cana is a five-star experiential resort designed to provide guests of all ages an incomparable luxury vacation filled with playful surprises. 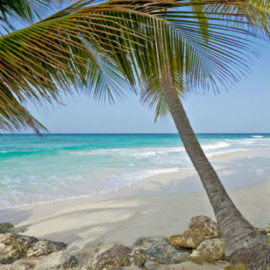 Located on the golden sands of Uvero Alto Beach, 60 kilometers north of Punta Cana Airport, this Resort provides both nonstop family entertainment and the renowned Gourmet Inclusive® Experience by Karisma. The result is an unforgettable getaway for Nickelodeon Fans of all ages. 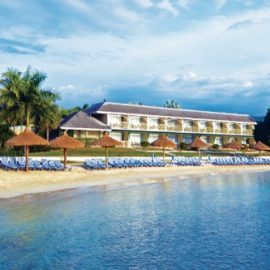 This beachfront resort features 208 suites designed to cater to a variety of travel experiences, from intimate Pads and Flats to Swim-Up Suites. Guests may also choose to book one of four exclusive Super Villas including the Pineapple, inspired by SpongeBob Square Pants’ own home. All suites feature indulgences like free standing tub, private patios, wrap-around terraces or balconies, and 24-hour in-room dining options. 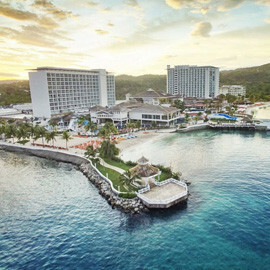 The Resort offers innovative cuisine, impeccable service, a stylish, playful décor, unique amenities, and around-the-clock entertainment to all of its guests. At the heart of the resort is Nickelodeon™ Place, including the Aqua Nick Water Park, Character Central, and Just Kiddin’ kids’ club. 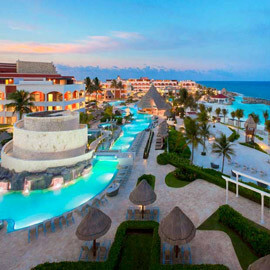 Guests also have access to 7 Gourmet Inclusive® Restaurants, 2 Gourmet Corners, and 2 Inclusive® bars and lounges within the resort and Gourmet Inclusive Village shared with neighboring Sensatori Resort Punta Cana. 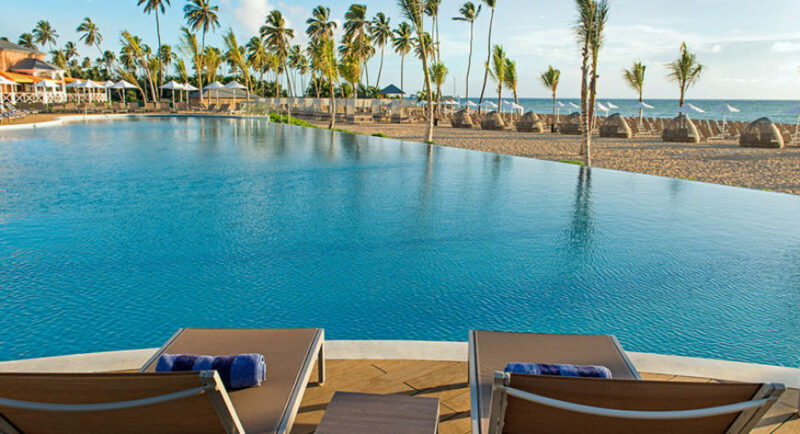 Located on the golden sands of Uvero Alto Beach, 60 kilometers north of Punta Cana Airport, this Resort provides both nonstop family entertainment and the renowned Gourmet Inclusive® Experience by Karisma. The result is an unforgettable getaway for Nickelodeon Fans of all ages. Amenities, which include Gerber baby food, strollers, cribs, kids’ spa robes and baby bottle warmers for infants and toddlers. 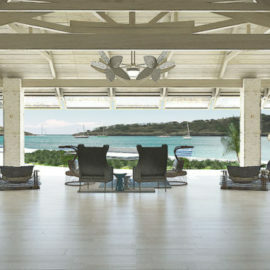 Inspired by the famous pineapple under the sea, this sumptuous one-of-a-kind villa is the resort’s signature dwelling. 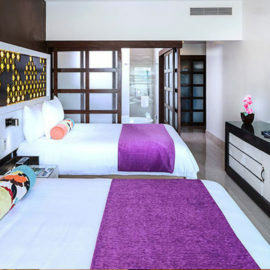 The two bedroom / three bathroom property features all the modern amenities and luxurious accommodations found in the Pool Super Villa but with a unique twist: all who enter are instantly immersed in the world of SpongeBob SquarePants. The Pineapple welcomes visitors with a special foyer – Inspired by SpongeBob’s home at 124 Conch Street. 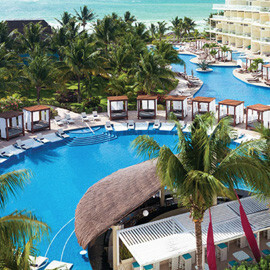 Guests can enjoy 1,500 square feet of breathtaking Bikini Bottom-inspired indoor and outdoor living and dining areas, a private master suite with a king size bed, smart TV, closets, an oversized marble bathroom complete with double sinks, rain shower, as well as an “Aguas del Amor” outdoor shower and a free standing tub. The second bedroom is on the upper level of the villa’s loft-style living room, and it is complete with two single beds, TV and private bathroom. The living room has a pull-out sofa bed, dining room, TV, play area, storage space, a full bathroom, and access to the Suite’s private gardens and sublime patio, where the villa’s signature infinity pool, sun-bathing beds and a dining and living area can be found. Private butlers take care of the Pineapple guests’ every need. From a pre-arrival questionnaire to ensure our guests’ preferences and needs are accommodated, to pampering services during their stay such as a private orientation of the property, activity bookings, preferred access to all the restaurants and spa, and daily premium magazines and newspapers. 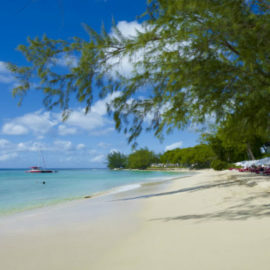 Private butlers will also take care of arranging tailor made private activities* such as a moonlight beach dinner prepared by a world-class chef, wine tasting, an in-suite afternoon tea party, pizza party or pajama party for the kids. *Surcharge apply. 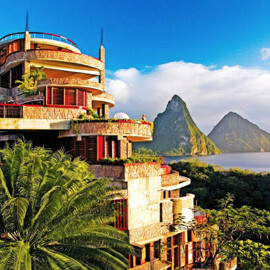 The two bedroom/three bathroom Pool Super Villas offer the utmost luxury in a truly spectacular Caribbean setting. Upon entering the villa, guests are surrounded by a water fountain entry hallway and discover 1,500 square feet of breathtaking indoor and outdoor living and dining areas, a private master suite with a king size bed, Smart TV, closets, an oversized marble bathroom complete with rain shower, double sinks, as well as an Aguas del Amor outdoor shower and a free standing tub. The second bedroom is on the upper level of the villa’s loft-style living room, and it is complete with two single beds, TV and private bathroom. The living room features a pull-out sofa bed, dining room, TV, play area, storage space, a private bathroom, and access to the Suite’s private gardens and sublime patio where the villa’s signature infinity pool, sun-bathing beds, dining and living area can be found. Private butlers take care of the Pool Super Villa guests’ every need. From a pre-arrival questionnaire to ensure our guests’ preferences are in-suite, to pampering services during their stay such as a private orientation of the property, activity bookings, preferred access to all the restaurants and spa, and daily premium magazines and newspapers. 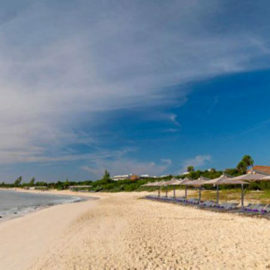 Private butlers will also take care of arranging tailor-made private activities* such as a moonlight beach dinner prepared by a world-class chef, wine tasting, an in-suite afternoon tea party, pizza party or pajama party for the kids. *Surcharge apply. The Swank Swim-Up Suite features a private wraparound terrace that offers guests direct access to the pool for spontaneous splashing and a special VIP feel. 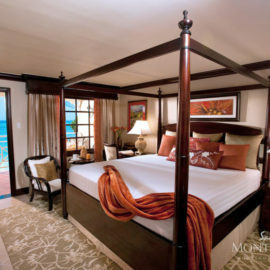 The Suite features a private master bedroom with a king size bed, 42" smart TV, a marble bathroom complete with a rain shower, double sinks, and a free standing tub. This Suite’s living room has a 48" smart TV, pull-out sofa bed, dining table for four, and access to the private wraparound terrace which features a direct access to the pool, a sitting area complete with a dining room, living room, sunbathing beds, and a round day bed for private lounging, napping or stargazing. 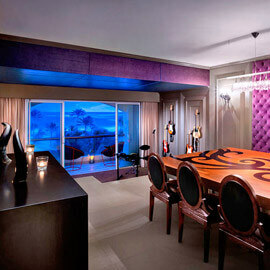 The Swank Suite features a wrap-around terrace for extra fun under the sun and stars. 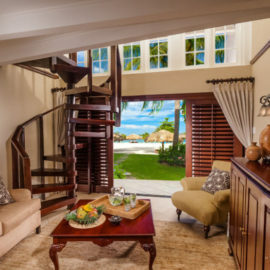 This Suite’s living room has a 48" smart TV, pull out sofa bed, dining table for four, and access to the private wraparound terrace which features a private plunge pool, a sitting area and a round day bed for napping or stargazing. The Flat Swim-Up Suite allows our guests do some spontaneous splashing with direct access to the pool from their terrace. Features a private master bedroom with a king size bed, 42" smart TV, a marble bathroom complete with a rain shower, double sinks, and a free standing tub. The living room is complete with a pull out sofa bed, 48" smart TV, and dining room area. The Flat’s balcony has an outdoor round day bed for private lounging, napping or stargazing. The Flat Suite features a private master bedroom with a king size bed, 42" smart TV, a marble bathroom complete with a rain shower, double sinks, and a free standing tub. The living room is complete with a pull-out sofa bed, 48" smart TV and dining room area. The Flat’s balcony features a round day bed for private lounging, napping or stargazing. Designed in modern style, this intimate dwelling features a terrace with a day bed and a sitting area with direct access to the pool. The Pad has one king or two double beds, a pull-out sofa bed, table, 48" smart TV, marble bathroom with double sinks, a rain shower and a free standing tub. Designed in modern style featuring one king or two double beds, a pull-out sofa bed, dining room, 48" smart TV, marble bathroom with double sinks, a rain shower and a free standing tub, as well as a spacious balcony with a day bed and a sitting area. This fun and funky family restaurant lets patrons enjoy mouthwatering world cuisine in a casual atmosphere. Pick and choose from the lavish food display with cooked-to-order options or opt to stay at the table and select from the à la carte menu during the evening hours. 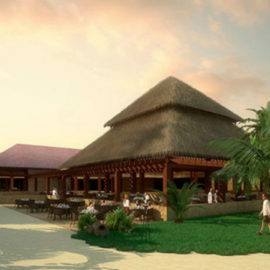 As the name implies, Fresco delivers fresh, creative and delicious offerings in breezy “al fresco” surroundings. 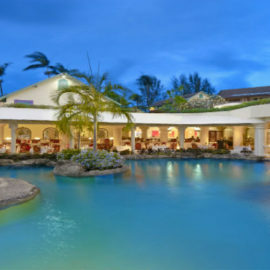 Enjoy a quick meal or a drink at the swim-up bar. Don’t miss out on our daily ceviche creation from today’s freshest bounties of the sea. 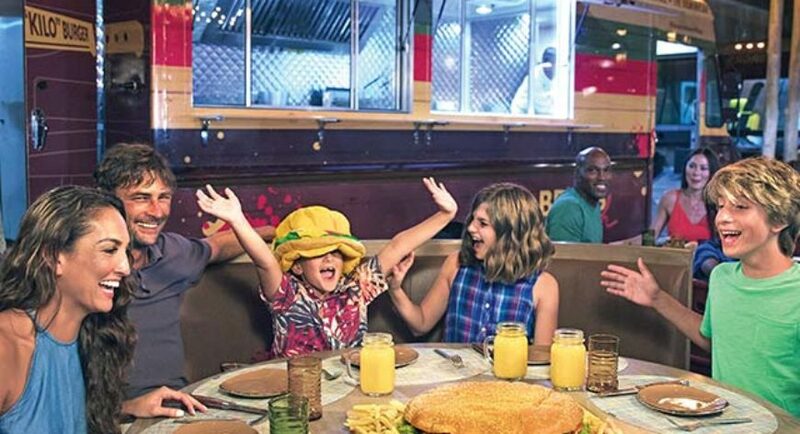 In the heart of Nickelodeon™ Place, Aqua Bite has a casual environment and easy, family-friendly fare. Enjoy a made-to-order Flatbread Pizza or a delicious Pita wrap and prepared salads. 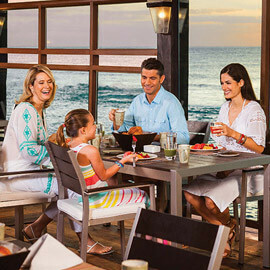 It’s the perfect spot to sip your favorite drink, recharge and share a laugh with family and friends. Inspired by the food markets of Latin America, Sugarcane is our most energetic Food and Beverage venue. All the food is freshly prepared, with an emphasis on making dishes to order to satisfy every guest’s unique tastes. The open plan Kitchen allows you to interact with our talented team of Chefs. Fresh bread, local produce & international ingredients are the cornerstone of our mouthwatering preparations. Our ample juice bar and tea bar will complement the experience. Private dining room is available for weddings and events. Regional influences and bold flavors are signatures of the culinary heritage of this beautiful island. Sicily comes alive once you enter this characteristically Italian venue. You can choose to sit in the attractively appointed dining room or enjoy the bustle of the Gourmet Village plaza from our outdoor terrace. BRGRS.PH takes the humble hamburger to a whole new level. Come by our Food Truck and choose from a selection of burgers, toppings, sauces and freshly-baked buns which are specially designed for each burger. Try our Machete Burger, built for a whole family, or ou Vegetarian Lentil Burger. It will be a burger experience you won’t forget. Get ready to experience some inter-stellar awesomeness! Spectacular light and sound effects accompany you as you board your family shuttle and prepare for takeoff. You and your fellow astronauts will dine on a menu of favorites from across the galaxy, served by our spacewalking staff. Even the cocktails are out of this world! Sangria anyone? At Vino Vino we specialize in a quality selection of wines and wine-based creations. Whether you’re joining us for a pre-dinner cocktail or a late evening with new friends, our in-house pianist will keep things bubbly. 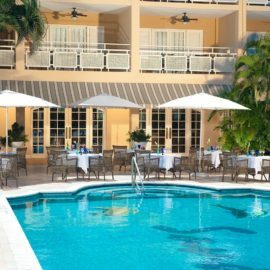 `Enjoy your favorite sun time cocktail while relaxing in the pool or enjoying the deck and its fabulous vistas of the Caribbean Sea. Jazmin offers a selection of international and tropical cocktails, ice-cold beers, soft drinks and naturally flavored waters to quench your thirst. And our lemonade, squeezed fresh daily, is not to be missed! Aqua Nick™ is the place to be for water-based activities. 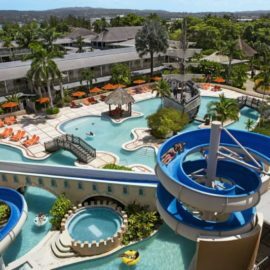 Water slides, splash pads, spray grounds and a lazy river are all located within the tropical environment of NICKELODEON™ Place. Guests can meet their favorite NickelodeonTM Characters throughout the day in this high-energy entertainment location. No trip to Nickelodeon™ Hotels & Resorts Punta Can would be complete without a visit to our own NICK kNACKS shop, conveniently located at the entrance to NICKELODEON ™ PLACE. 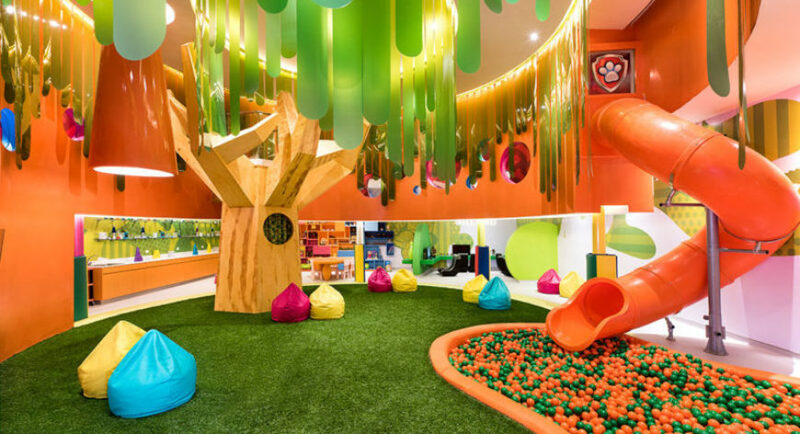 Inside, you’ll find the ultimate collection of clothing, toys, souvenirs, movies and apparel for every Nickelodeon Fan. 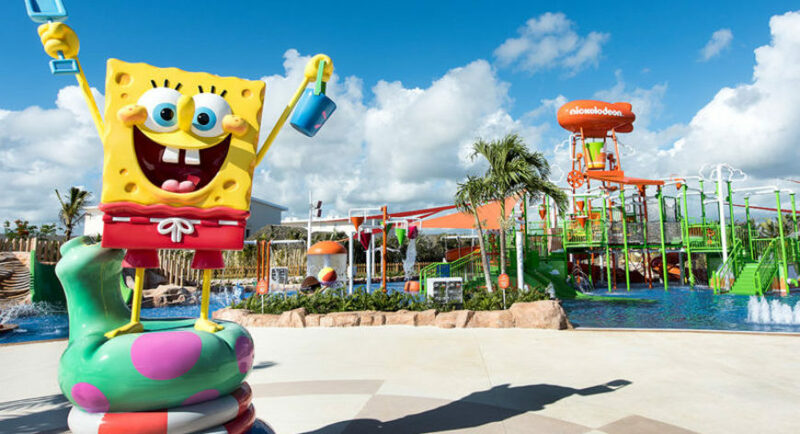 An Outdoor entertainment venue where guests will encounter special Nickelodeon events and local performances from the region * Nickelodeon™ Place is a 100% non-smoking facility. Tap into your inner state of Zen in one of Vassa Spa’s treatment and relaxation spaces. In addition, Vassa Spa offers five beautifully-appointed treatment suites, including a couples’ suite and a luxurious bridal suite. 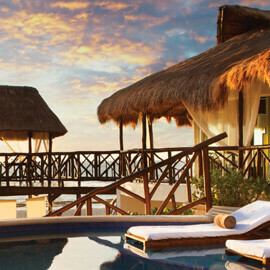 We also offer our signature treatments in five “al fresco” outdoor treatment areas.